“…Lord, I am so grateful for the changes you are making in me and Jaden [my son, then 6-years-old] and our relationship. We have been two opposing forces for as long as I can remember. I would lash out at him in frustration, desperation, anger. I would scream and say unpleasant things to him, trying to force him to behave in a certain manner. All futile actions leading to fear, anger, dislike, tears, screams, and hurt in both directions. Yesterday, we took a positive step and I cant thank you enough. After a day of frustration, repeating instructions, rough talking and hurt feelings, it was time to go to bed. My little Jaden burst into tears saying, “I had a hard day!” I can imagine the old me telling him to stop crying and go to sleep, being too tired or caught up in my own actions, to-do list or emotions to deal appropriately with the situation. But last night was different. I believe I’m learning to pray without ceasing – my heart is open to you and I’m listening. Last night, upon hearing my baby’s tear-filled declaration, I asked him to climb down from his perch on the top bunk. 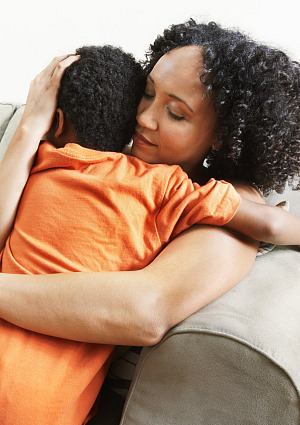 I removed myself from Nikko’s bottom bunk [my then 3-year-old son] and sat on the floor, readying my lap for my boy. He found his spot and we held on to each other as I spoke the sweet and comforting words you gave me just for him. I let him know that hard days are something that we all have and how I’d had some this very week, but that it was alright because that’s why we have family – to help us through our hard days. We can talk about what’s bothering us and work together to make it better. I told him he was a great guy and that I love him so much. Then I prayed for him, asking you to give him peace, comfort and joy, allowing him to have sweet rest through the night. As the prayer came to a close, his sobs subsided and we could sense the change in the room. Saja [my daughter, then 8-years old] spoke up and said, “Mama, your making MY eyes water up!” And I must admit, I was a bit watery, myself! During this time, Nikko was in his bed, interjecting sweet 3-year-old sentiments and Zion [1-year-old] was laying in Nikko’s bed quietly. It was a sweet, powerful moment with my babies and our God. My prayer is that my little journey down memory lane reminds you, when you’re lost in a sea of frustration, the best thing to do is to run to the father, cast your cares upon him and feel his peace wash over you. He did it for me and my Tribe back then, he’ll do it for us again, and I know he’ll do it for you, too. One of the things that I have noticed, as the Mama of 4 munchkins is that no matter where I am or what I’m doing, my kids come and find me. They can be deeply engrossed in a game of tag, or pretending to be the Super Mario Brothers, but somehow, their play area seems to gravitate towards me. They may not pay attention to me or even speak to me in the middle of their game, but they ALWAYS find their way to me. I must admit, this fact amuses (and sometimes annoys) me. When my focus is on myself – on how I just need a bit of peace and quiet, or time to concentrate – I can get frustrated. But when I step back and look at the situation through the eyes of my babies I realize that they just long to be near me. They search for me, even though they may not realize it. This morning, I took a mental step back from the noise and the tiny feet running circles around me and heard that still small voice say, “search for Me, like they search for you.” God spoke to my heart and reminded me that I need to be more like my children. No matter what I am doing, no matter how busy I am, no matter what is going on in my life at the moment, I need to gravitate towards my Father. I need to long to be in His presence. Even if I’m not “in prayer” at the moment, or in a physical church service, my heart should long to be near Him. Take a note from my munchkins today and let your heart long to be near your Heavenly Father. There is safety, peace and comfort in his presence.